TEFpad is a tablature editor designed for the iPad that implements most features available in the TablEdit desktop program. It is also compatible with iPhone and iPod Touch. Just like TEFview for iOS, our free file viewer, TEFpad opens, displays, prints and plays all TablEdit files (.tef format). It imports as well many types of music files (ASCII tablatures, ABC files, MusicXML, MIDI, Guitar Pro, PowerTab...). 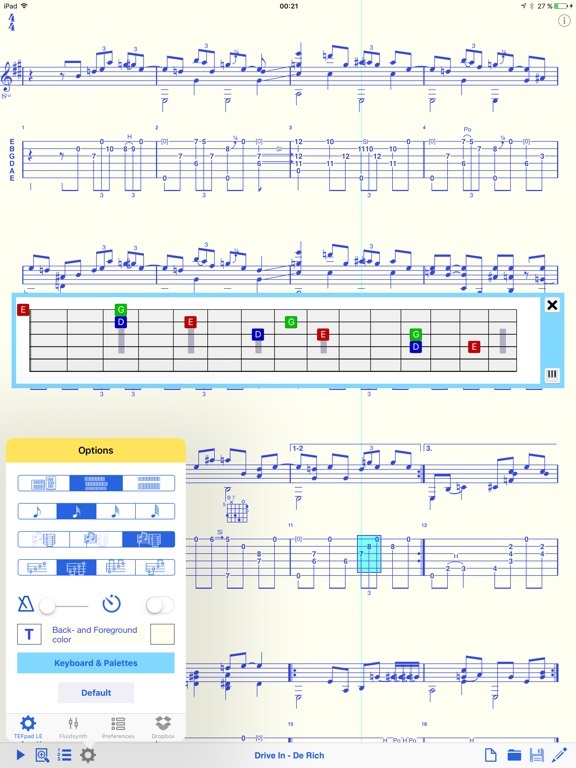 In addition to this, TEFpad opens TabRite files and lets you create new tablature arrangements from scratch. The files you have created on your device with TEFpad can be edited and saved without any limitation. Warning: You can edit files not created with TEFpad or imported into TEFpad, but only the first 16 measures can be saved. Likewise the app does not allow copying the contents of one of these files into another .tef file. To get rid of these limitations, you can upgrade to TEFpad Pro (available as an In-App purchase).